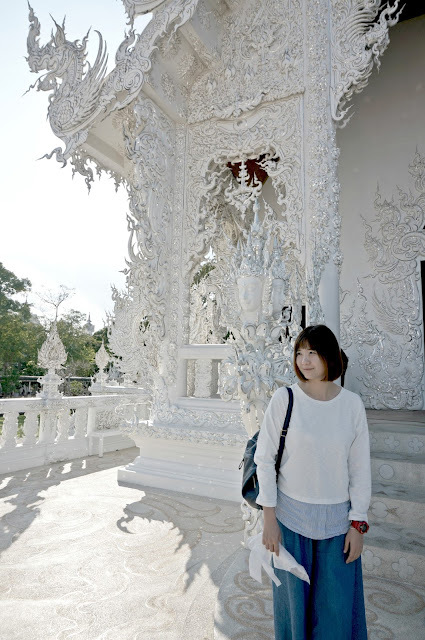 Chiang Rai has been in my bucket list for sometimes, and I am glad that I finally made it here in February. 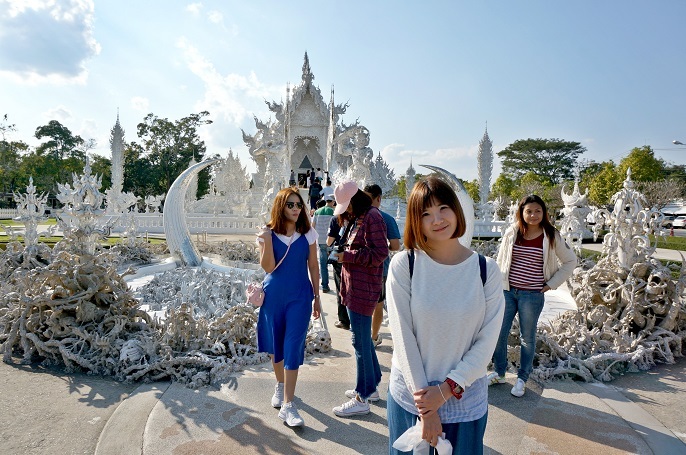 It was such a great opportunity to visit Chiang Rai after the visit in Wangdang Uttaradit since it was just about 5-6 hours drive. 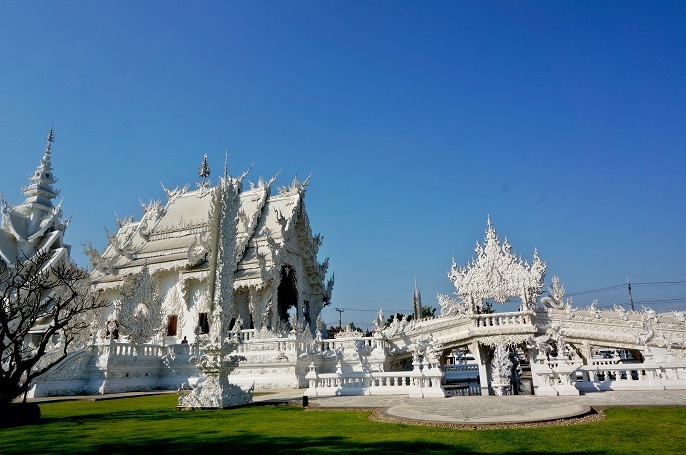 We decided to stay in Chiang Rai for 2 days, and followed by Chiang Mai before heading back to Malaysia. Oh Chiang Rai! I always heard about you from my friends and families, and now finally I got the chance to visit you in person! 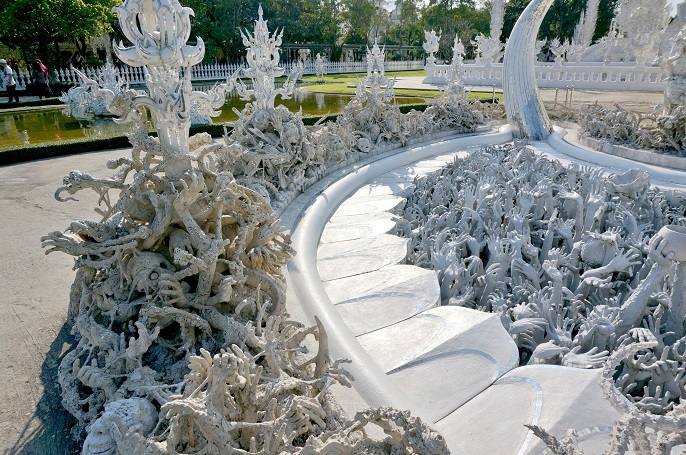 Wat Rong Khun, is the main reason motivates me to visit Chiang Rai. I have been wanting to visit this beautiful temple ever since I looked into the beautiful pictures from the internet in few years ago. All the white pictures impressed me a lot, and I know this is one of the place I wanted to see it with my own eyes! It took us about 5-6 hours drive from where we were in Wangdang Uttaradit. I can't say it was a long drive, when we had a few stops at some local temples, and petrol stations. Big thanks to our driver who gave us a safe journey all the way to Chiang Rai. 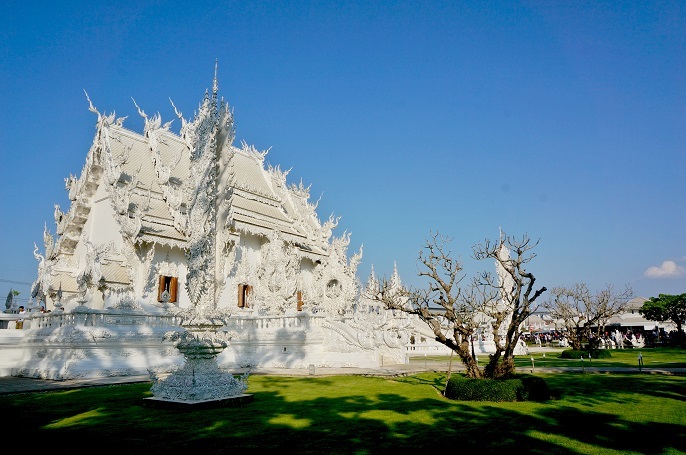 When I first met the white temple, I was totally shocked! My jaw was dropped for the first time witness the unique temple, with it's all white painting on the unique designs and architectures. It needs entrance fees at THB50 for one person. Since it took me such a long time to visit this beautiful place, seriously I can't say no for paying it. 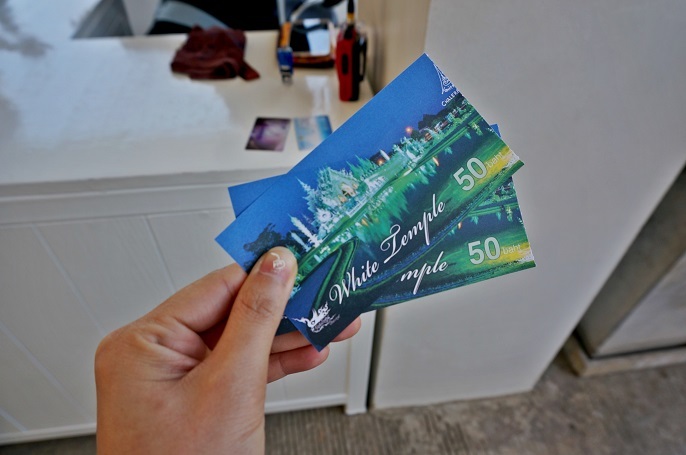 However, it doesn't mean that you don't get to see the white temple without paying an extra entrance fees. It's just that you are not allow to enter and walk inside the temple. 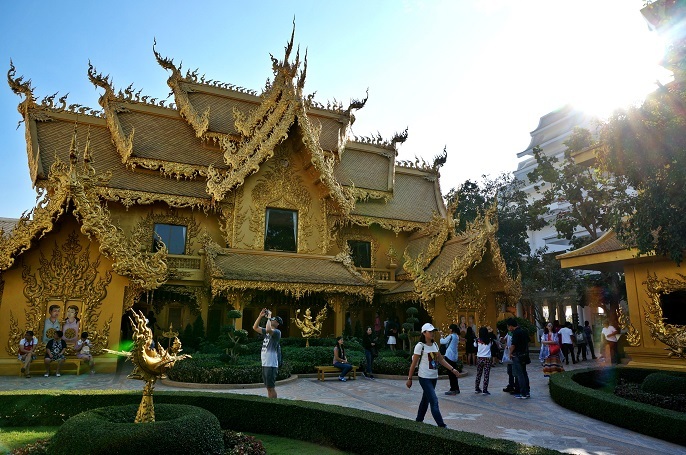 Due to the popularity of this temple, be prepared with long ques, flooded with many tourists from different countries, and noises from the busy buzzing crowd. It can be very annoying, especially when a temple should be quiet and peace to visit. 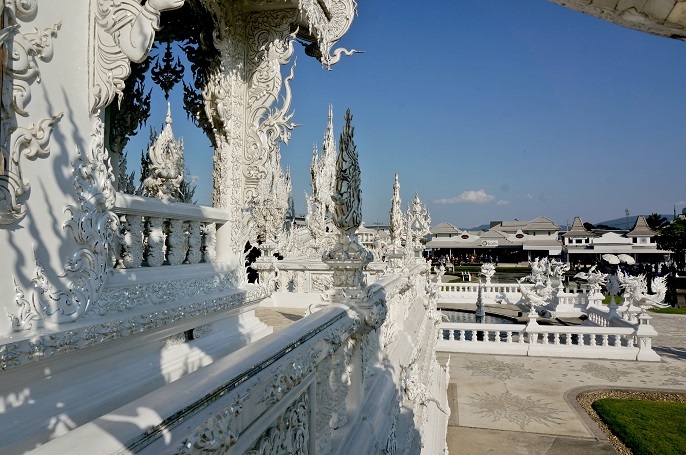 Everything in the white temple has an unique architecture, design, and impressive attention to detail. Some figures are very special that you don't normally find at other temples such as different skeleton heads hanging on the trees, hundreds of ghostly hands over the bridge and so on. It's a mixture of creepy and beautiful feeling. No shoes are allowed when you walk inside the temple. So everyone will be given a plastic bag to put your shoes inside. The temple is still work in progress. I can see the backyard is still expanding with a few more buildings. 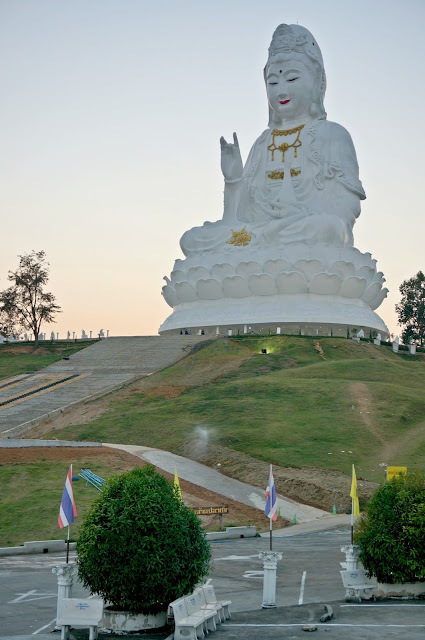 I am sure it's gonna be a true big master piece in Chiang Rai after everything is completely finish. 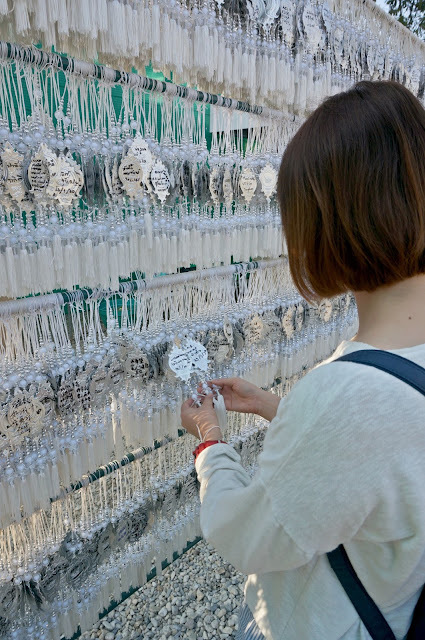 I bought a silver prayer plate and put down my wishes before I left the beautiful temple. #lol It's actually a bathroom! My advice is do not leave the temple without visiting this special piece! 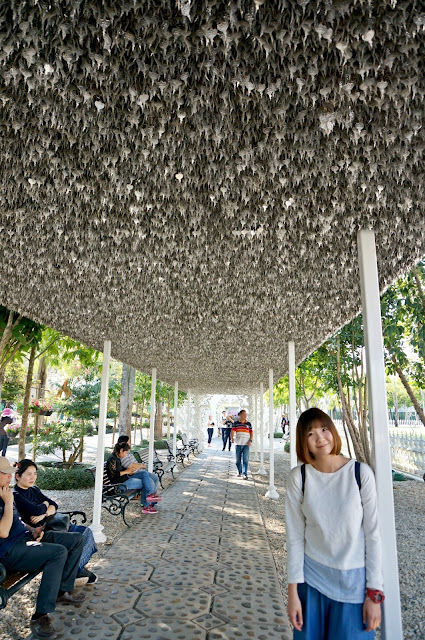 I truly adore with the passion of Artist Chalermchai Kositpipat. 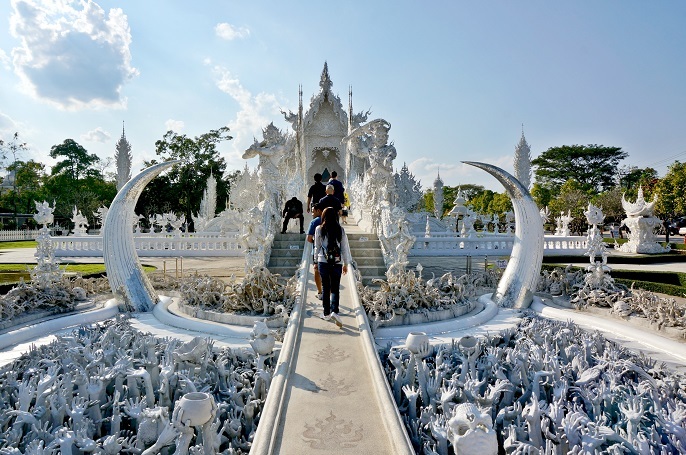 I would say it's the best master piece to visit in Chiang Rai even though you need to pay an entrance fees at THB50. 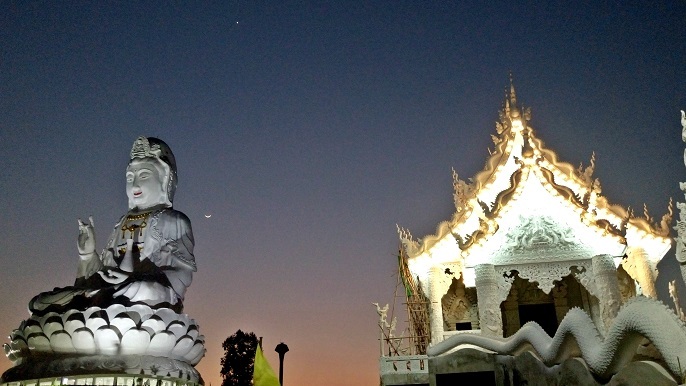 I think it's all worth while since it might take you a long way to travel to Chiang Rai. 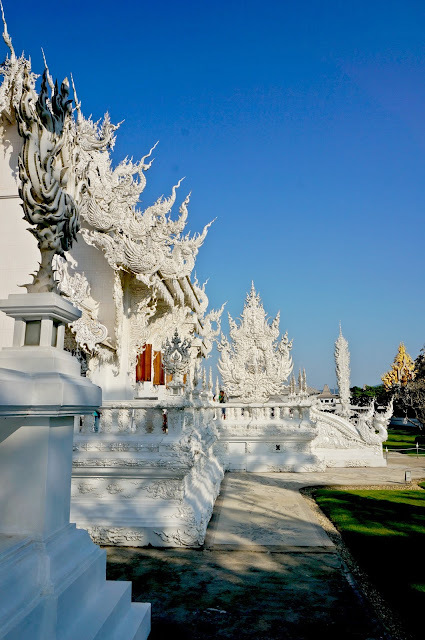 If you are planning to visit Wat Rong Khun, I would suggest you to visit in the early morning or late in the afternoon. It was extremely hot when I was there at about 3pm. 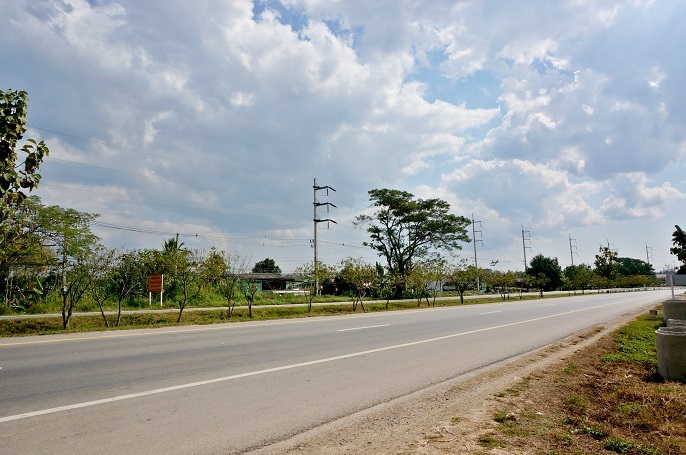 With all the noises around, and the super hot sunshine, it can make you sweaty and moody on your trip. 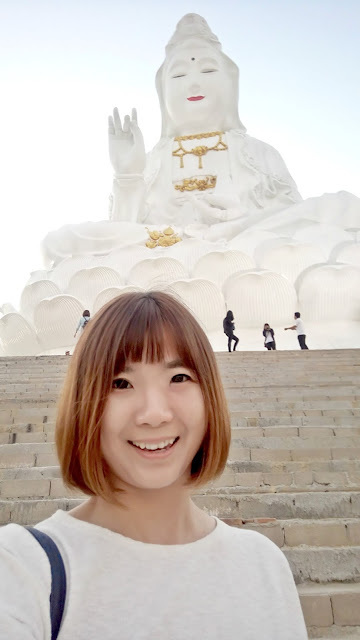 Before the sunset, we went to Wat Huai Pla Kung Temple, where the giant Buddha located at. Since it was kinda late in the evening, so there aren't many people over there. It's quite rush for us, as we must capture as many pictures as we want before the sky went dark. 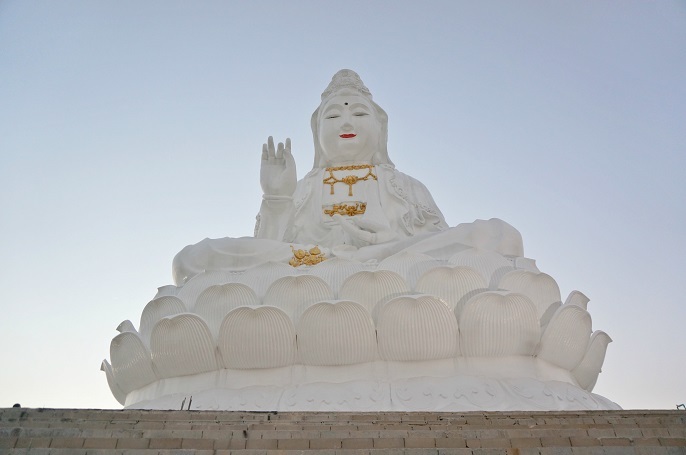 The big Buddha statue has total 9 story Chinese temple where you need to climb the long staircase to reach up to the hill. There are some public carts available if you can't climb the stairs, however a small token must be given to the driver. 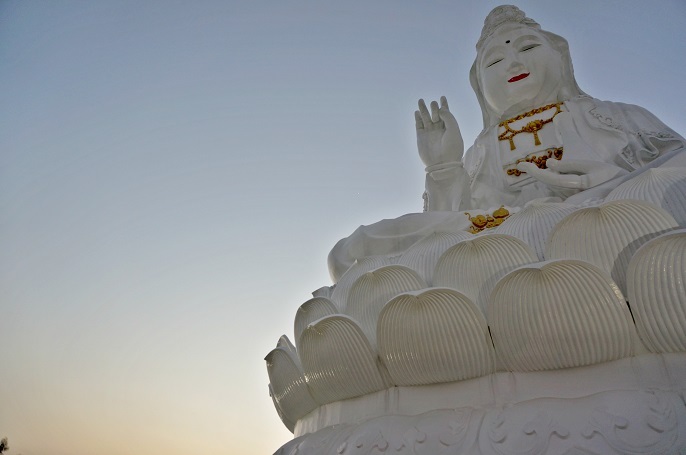 There is another lift to take you to the 25th floor, where you can see another Buddha located. This cost you extra THB40. We didn't go for it, as we thought we didn't have enough time, and the view from where we were already amazing and impressive. The place with the pagoda, and temple is not yet completed. Hopefully it will all done when you get there one day. 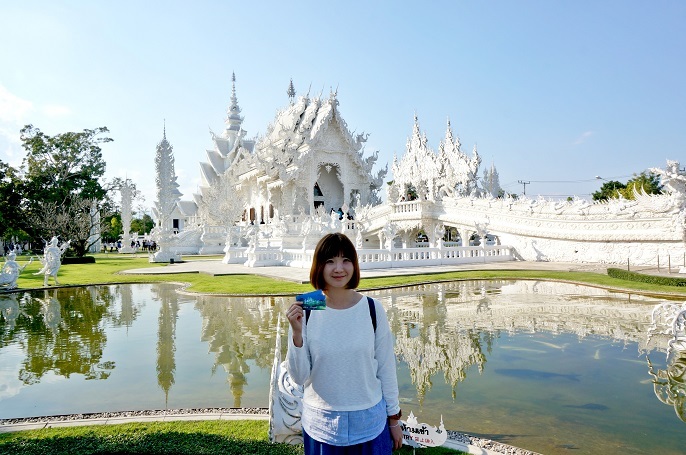 My first day in Chiang Rai was great. 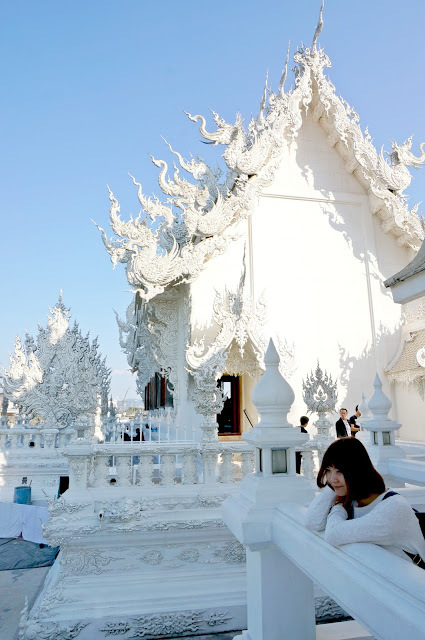 The weather is getting colder, and the most important thing is I get to witness how beautiful the white temple is. 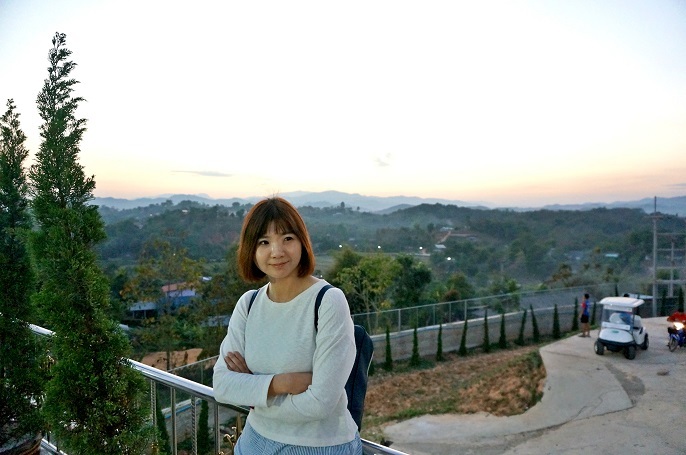 On the second day in Chiang Rai, we visited Golden Triangle, a local bazaar, and a tea farm up at the mountain. 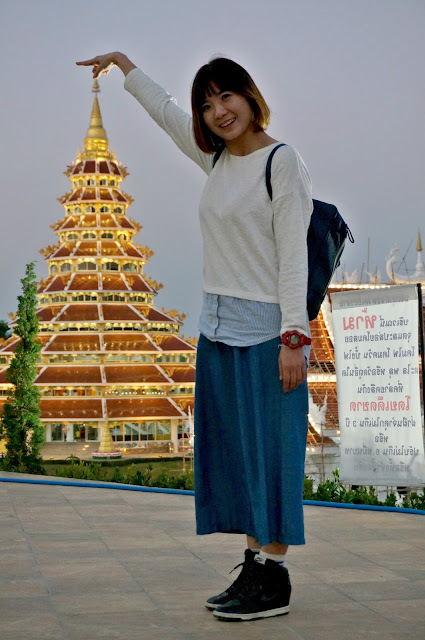 Well, stay tuned to my next blogspot of Chiang Rai so that you don't miss out!.